WWR dips into the Southern Hemisphere, for a change. Bush has shown at a number of galleries in America and was included in Phaidon’s Vitamin P2 survey of contemporary painting, so he has some form, although not enough apparently to have been included in the vast survey of Australian Art at The Royal Academy last year. But he is a serviceable mid-career artist with a strong following in corporate and public collections in Australia and at 56 duly receives a retrospective in a modest public – or semi-public – gallery. The Ian Potter Museum is described as a ‘semi-autonomous arm of The National Gallery of Victoria’, situated at Melbourne University, if I’ve read the literature correctly. The museum devotes several rooms to Bush’s mostly large-scale paintings, hung according to recurring themes rather than strict chronology. The show is accompanied by a slim but lavish hardcover catalogue and is titled Steenhuffel for some reason. The press release offers no explanation and the best I can find is the name of a small town in Northern Belgium, noted for a mediocre brewery or as a joke term for numbers swelling a trade union delegation in order to make walkouts look more impressive. This seems a little arch or anarchic, however previous shows and works by the artist have also taken obscure Lowlands place names, so perhaps it nominates some remote lineage. Unfortunately, the flashy museum site offers only three illustrations of his work; however Bush’s Melbourne gallery and his own site usefully supplement online reproductions. 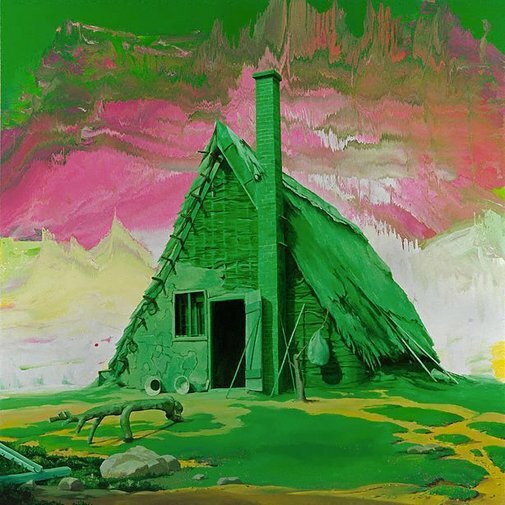 The artist is best known for lurid Post Modern landscapes, an uncomfortable mix of picturesque mountain peaks fused with pools of marbleised enamel, ramshackle rural buildings and figures in period costume or fancy dress in distinctly theatrical pose, all painted with a spare, brushy vigour. The artist avoids specific art historical parody or pastiche, a common Post Modernist trait, although the inclination to virtuosity is nevertheless present. He concentrates however on pictorial sources serving firstly as historical document or recording official, perhaps scientific, enactment and with deconstructing or undermining these. The depiction of nature or wilderness, discovery, invention, adaptation and remote models or ideals all announce a cheerful rewriting of history and standards, a deliberate embellishing or abbreviation that can more accurately be labelled Post Colonial*. Where Po-Mo broadens the cynical recycling of Neo-Expressionism to pre-Modern sources and mixes conflicting styles more or less arbitrarily, Po-Col finds greater prestige or legitimacy in the very same tendencies in the provincial or peripheral (hitherto simply regarded as inept or misguided), eagerly advertises a free-wheeling adaptation of the fashions of the centre or centres as central. The Post Colonialist exalts in a tradition of endless migration and colonisation, in exploitation and abandonment as a kind of nihilistic sublime. The second rate is always better than the first, last out turns off the lights. Yes, it’s bad, super bad. Not surprisingly, neither centres nor peripheries find Po-Col all that compelling and it resides mainly in the regular Biennales or international surveys of curatorial whim, appropriately decorates the restless caravans of the global economy and its facetious diplomacy. Even in Australia, Po-Col at best finds acceptance as academic sophistry with occasional bureaucratic lip service. The drift to Po-Mo in the eighties however is irresistible for artists of Bush’s generation, the rejection of abstraction, the acceptance of revision and recycling of styles, the call to pluralism, a more detached attitude and recondite allusion all steadily supplant the immediacy and bombast of Neo Expressionism. So when does Bush join the bandwagon? Since Steenhuffel foregoes the chronological approach, this review undertakes a little old-school developmental tracking. The artist emerged in the mid eighties; following four years study at the RMIT with urban landscapes in a restrained photo-realist style that perhaps owe something to older Australian painter, Jeffery Smart. 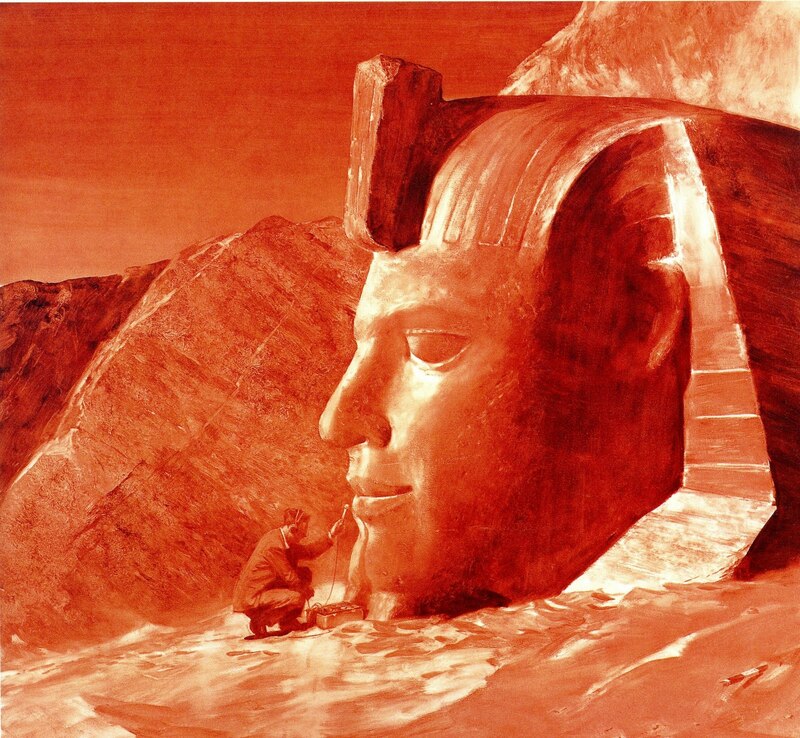 The taste for a surreal ordering, especially colour coding however, does not really find distinction until the artist shifts his subject matter to more historical and allegorical sources, still notably photographic but now keyed to a deliberate staging of events. Works such as Field Day (1985) and From The Field to Figuration (1987) announce a new levelling of the allegorical and factual, grant a modest document of an event an inflated rhetoric, grant a whimsical metaphor a sober, literal truth, pace photographic record with painterly inflection. 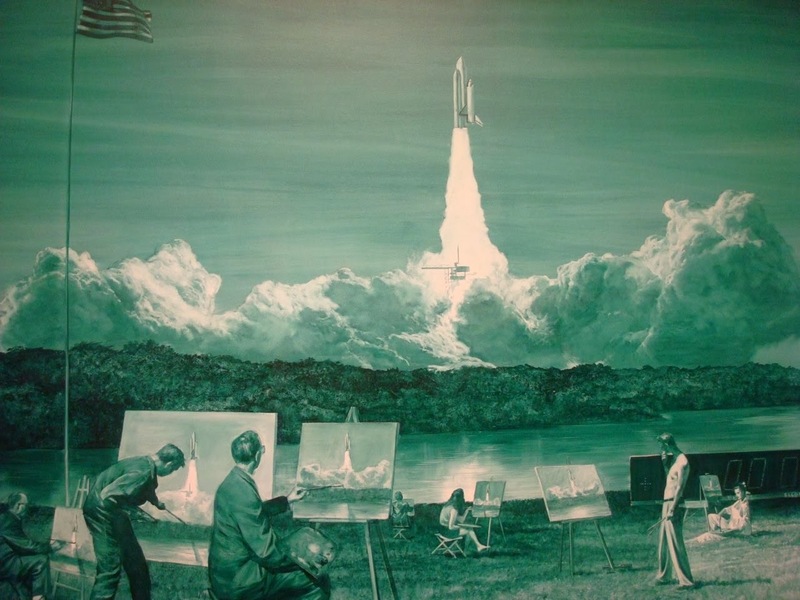 But the wry, skewed title From The Field to Figuration also alludes to an important exhibition of local painting at The National Gallery of Victoria in 1986, and this kind of art historical in-joke strongly suggests another influence, that of Mark Tansey. Tansey emerged some years earlier, with suave and flippant illustrations of various critical controversies in art history, such as The Triumph of New York School and the drier, literary tone is perfectly in keeping with the Post Modern drift, if essentially conservative. Significantly, Tansey adopts distinctive monochrome palettes, giving the paintings something of the quality of a cheap print, toying with a Post-Pop dissipation and just such monochromes are soon adopted by Bush, in some cases, there are striking parallels in imagery. Bush persists with monochrome treatments intermittently, but retains little interest in Tansey’s glib one-liners. The influence is felt more in the whimsical figures that Bush then adds to 18th century Romantic landscapes, generic scenes of wilderness that were the first templates for colonial artists picturing Australia. Photographic sources thus give way to pre-photographic events and more openly mythic treatments. Here, the artist portrays himself as introducing or discovering native features, including scenes where he blackens his face, presumably to ‘integrate’ more with nature or perhaps from trying. But the scenes are no more than a pantomime of historical record, either anachronistic in costume, absurd in situation or both. The effect might have been funnier at the time, but in retrospect it evinces a troubling ambivalence. For, while Romantic accounts of colonial history are distanced and mocked, it would seem to make way only for self-important posturing on the part of the artist. A mythical virgin land, an un-colonised wilderness lures the artist out to play, grants him room to be himself where the latitude is grandest. The Post Colonial looks decidedly self-regarding on these terms. Indeed, later works are more forthright, such as Have I got it? (1990) where the artist poses as a gold prospector but slyly inquires of artistic acceptance. Well, as they say, “If you have to ask, the answer is no.” But for The Wild Post Colonial Boy, distance or pretext would seem to be necessary, either from the past or immediate situation and as often summon disguise or protection. 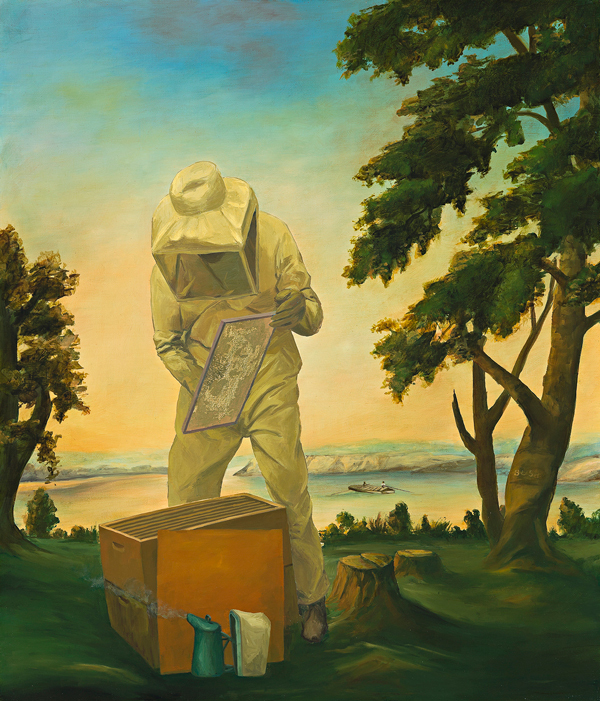 A parallel series of works from the late 80s employs the figure of the apiarist in full protective clothing, attending bee hives, again in generic 18th century Romantic wilderness. The activity is such a specialised form of cultivation, at first it seems a perverse choice for a colonial theme, but in other respects the all-concealing uniform and vaguely scientific appearance (pace Field Day) offer a similar insulating or detaching quality to the figure. Here the figure connects with nature in a strict role, confined routine. The apiarist recurs in later works, happily, the artist as gadfly explorer is soon replaced with a less personal protagonist. But before that, Bush’s Romantic melodramas attain an unexpectedly Neo Rauch-like tenor, although this in 1992, predating the German’s interest in 18th century Romanticism by at least ten years. While they share a certain lurid palette and self-portrayal amid stirring events, the difference is that nothing in a Rauch would be quite as stable or slavish as the Bush. A more ruthless and restless concern with drawing steers Rauch clear of pastiche and the temptation to virtuosity, while nevertheless driving a similar Post Modernist agenda. As indicated, Bush soon tires of his drama queen turns or at least senses they are getting in the way of the Po-Col message and introduces a surprising new hero, Babar the Elephant, in serial grisaille works, titled The Lure of Paris, commencing in 1992 (the linked example is number 22, from 2002, differences between versions are usually subtle matters of cloud or rock formation). With these works the artist neatly inverts the pictorial order of From The Field to Figuration, granting the landscape a literal rendering, while the figures now become token or metaphorical mountaineers. But the change is surprising and successful in a number of ways. Babar for example, is represented by a doll rather than simply a realistic illustration so that limbs and facial expression remain stiff or impassive, accenting the play with tokens or models (this Po-Mo trait discussed elsewhere). Three Babars appear in the paintings, confounding identification of a single character and each Babar is lit by separate spot or floodlights, heightening the melodrama of the tableau as well as introducing a certain tonal incoherence or admitting a montage structure. The famous children’s stories of Babar by Jean de Brunhoff involve an orphaned elephant who finds his way to a modern city and learns many advantages before returning to rule in the jungle. For the Post Colonialist the tale is seen as teaching the benefits of colonisation and for Bush, the implicit model of Paris for colonial culture, since the book has a French author. We pass over the reasoning here, tactfully, to note only that Paris in the title therefore alludes to a remote, playful ideal for culture, particularly painting, rather than location upon a barren shoreline of either Africa or France. By the same token, the project then invokes a childishness to aspiration or character, which ought to be troubling, although this may well pass for cuteness among the less demanding. The series so far comprises at least thirty versions, all 183 X 183cm, suggesting market demand as much as formal rigour. There are also smaller works that reprise the composition under Australian botanical nomination, such as Lady Campbell Weed, Duke of Normandy (2010) where the monochrome purple matches that of the flower of a notorious weed, known under various colloquial names, initially introduced by apiarists. These changes to the work are so abrupt and sweeping one suspects inspiration or influence among contemporaries. But while some details coincide with contemporary work, the package is uniquely Bush’s. 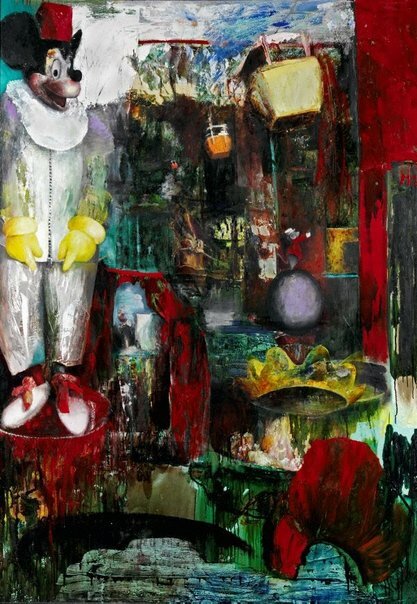 Still, it is worth noting that toys and nursery characters enjoy prominence around that time in the work of Julian Schnabel and Jeff Koons amongst others, while closer to home, Susan Norrie’s prize-winning painting Fete (1986) featured Mickey Mouse dressed as a Gilles-like Pierrot. Her mix of Pop Art, gestural abstraction and pre-Modernist allusion placed her at the fore of Australian Post Modernism by the late eighties. Incidentally, she too was omitted from the Australian art survey at The Royal Academy. But the point is that Bush’s Babar is in good iconographic company by the early 90s, although now assigned a vaguely Post Colonial mission. And it is a mission the artist has some difficulty advancing. There are works that replace Babar dolls with people in comic elephant costumes, but while these maintain role-playing or disguise, they hardly advance a Post Colonial critique. 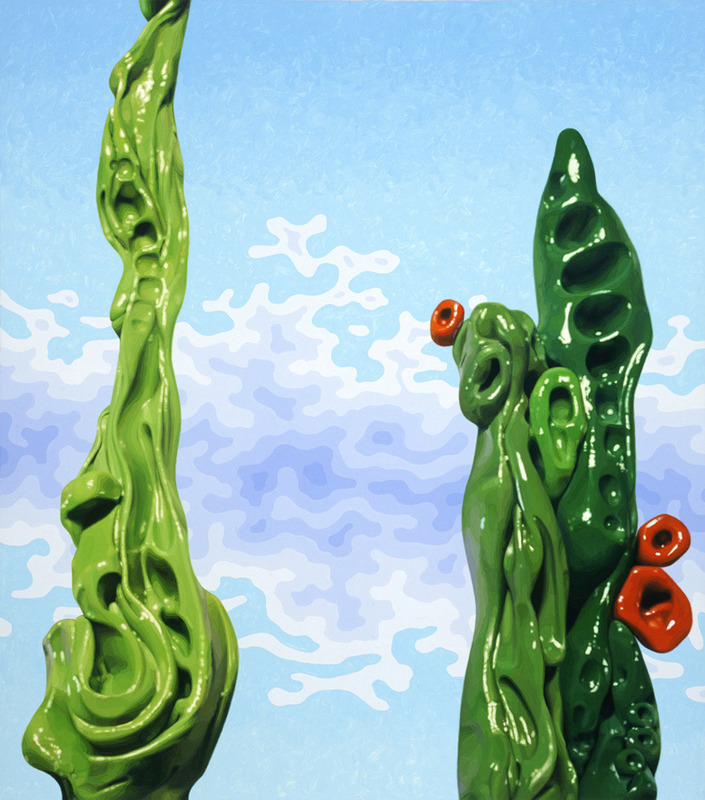 Self-composure’s Inevitable Silliness (1997) finds the artist unable to render the alpine background as more reductive or fragmented tableau, uncomfortable with frivolous elephantine identities. The use of alpine settings from this time is also problematic. While clearly non-African, they are by no means uniquely French or even European. Indeed, snow capped peaks suggest resorts and recreation as much as lofty ambition or Romantic retreat. In short, Po-Col does not get much past travel brochures by this route. Other works in the nineties settle for more literal subjects, must trade in quaint brand names or diligent finish, but essentially announce a project losing impetus, distracted by virtuosity. The turn of the century finds Bush attempting greater montage, suggesting exotic or perhaps global trade as a more oblique Post Colonial aspiration. There are also works that offer more literal modelling, yet abstract tableau, only to lose Post-Colonial focus, look more like reckless versions of the work of Alexander Ross. The tableau maintains some allusion to France in Col du Galibier (2003) but now heights for paint sell painting and cultural elevation well short. A new element emerges in works such as I Have Come to the Creek (2003) where poured and dripped enamel are used to suggest alpine backgrounds. These are soon modified with skylines and greater definition to trees, or in some cases depart for more abstract phantasmagoria. Marbleising and dripping effects these days are of course usually reserved for abstraction in its cheesier, more ingratiating reaches. One needs look no further than contemporary Australian, Dale Frank for example. The attraction for Bush is unlikely to have been purely for their kitsch value, naturally. Failing more deliberate staging or creaking tableau, the work possibly embraces stylistic contrast as an alternative means of disengaging from the picture. Yet the division between poured and brushed elements rapidly assumes a familiar duality. The poured elements are diverted into a landscape setting; or nature at its most fluid or fluent, while brushed elements concern themselves with man’s more fixed structures, the cultured and cultivated. The work starts from supposedly chance elements to channel these successively into more precise content, from background to foreground, abstraction to figuration. The scheme is elegant but this is precisely the kind of primacy or foundation that Post Modernism rejects. The paintings look for a starting point in the same way colonists look for a home. They want a wilderness only a puritan would buy. But cornball fundamentalism plays well in certain quarters. The artist’s 2007 show at Goff + Rosenthal in New York was reportedly a sell out, in every sense. The Post Colonial turns out to nurture its own myths after a while and a market in moderation. The backdrops of nature at its runniest; paint where it’s poured; prove a place for modest settlement, brief industry and few attachments. Inevitably, the pools begin to pall and a claim is soon worked out and by around 2011 more peremptory brushwork begins to assert the priorities, abstract into the bargain. By now the work allows Baroque flourishes, if only to underline an essentially decorative engagement, a borderline affliction. The work is generous, inclusive, polite and assiduous, bright and busy, thoughtful and terribly nice. But it is not, finally, moving or personable, passionate or challenging. Art has room for all of course and no one can begrudge Bush his day in a museum at this point, but many visitors will find their stay a little hollow. *Post Colonial has a different meaning in literary criticism.